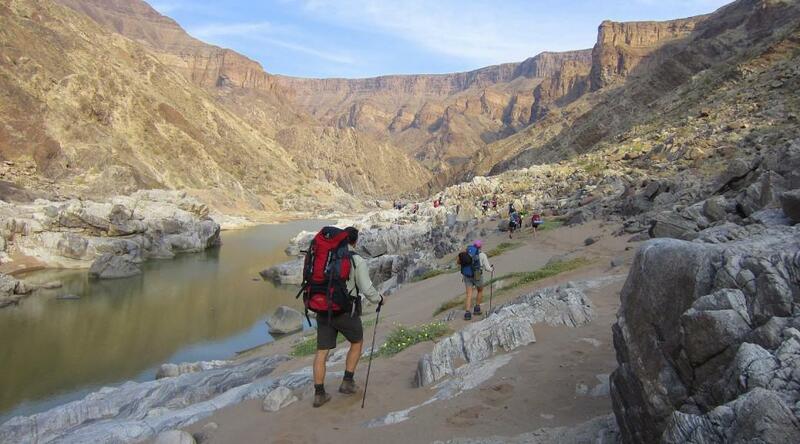 Most sources cite the Fish River Canyon as the second largest canyon in the world, after the Grand Canyon in America. 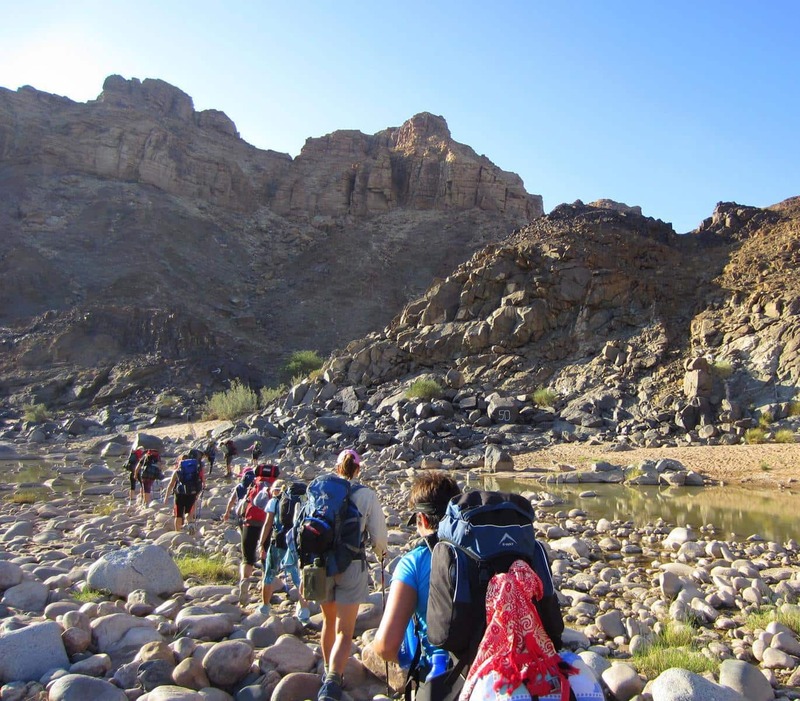 It certainly is one of Africa’s great natural wonders and the iconic five-day hike is rated among the top treks in the world. If you follow the river diligently, the route is about 90km but thanks to some scenic shortcuts we hiked 75,5km in total. 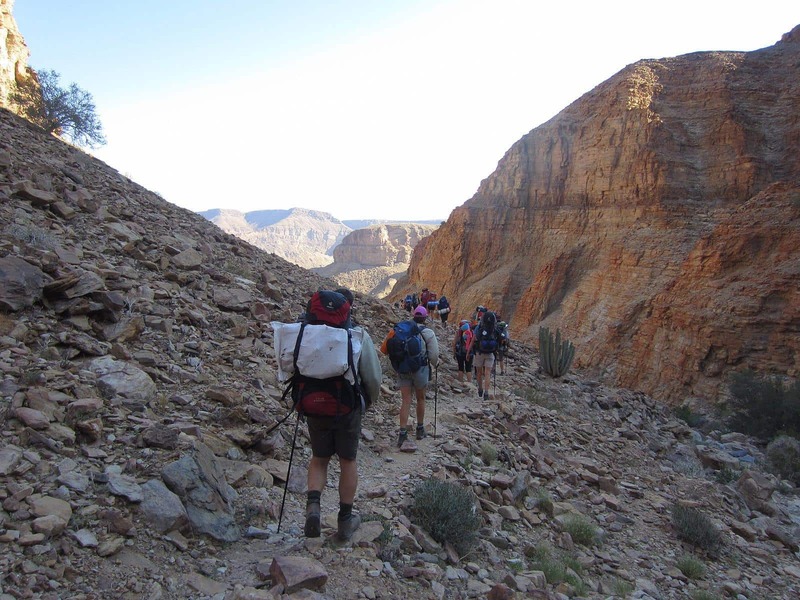 Officially the distance is covered over five days and four nights but we spent five nights in the canyon as we preferred to start the initial steep descent at midday. 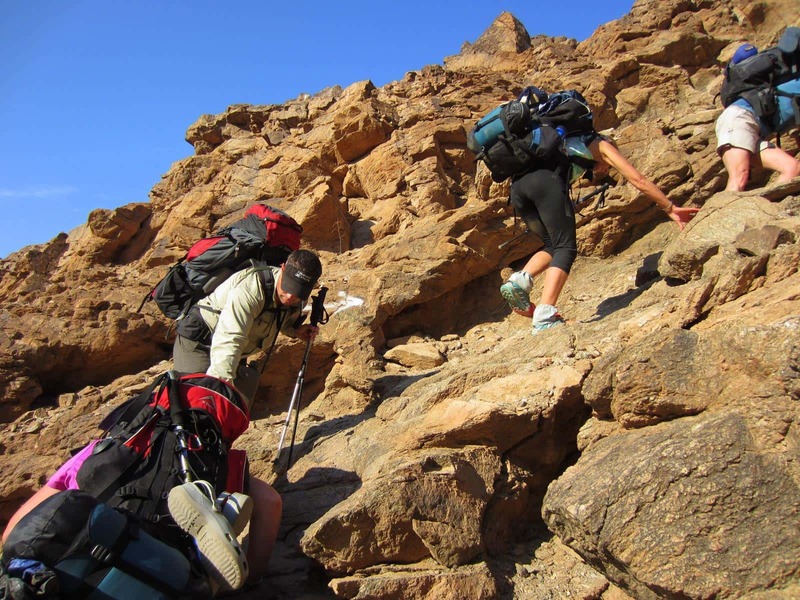 It is a tough hike as you have to carry everything that you will need to survive for five days (apart from water) and although the terrain is not technical, thick sand, boulder hopping and exposure to the elements make it quite challenging. 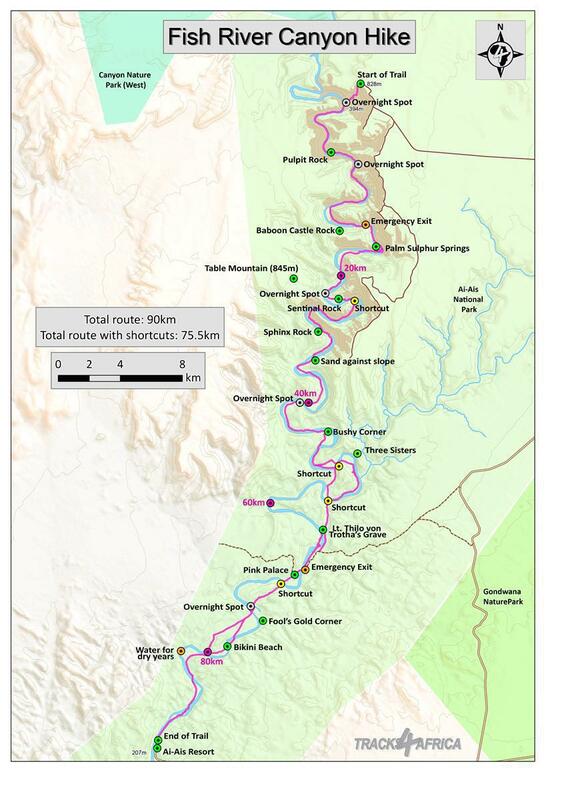 There is no marked trail in the upper sections and no official overnight stops. You have to find your own way, monitor your progress and decide where you want to camp for the night. 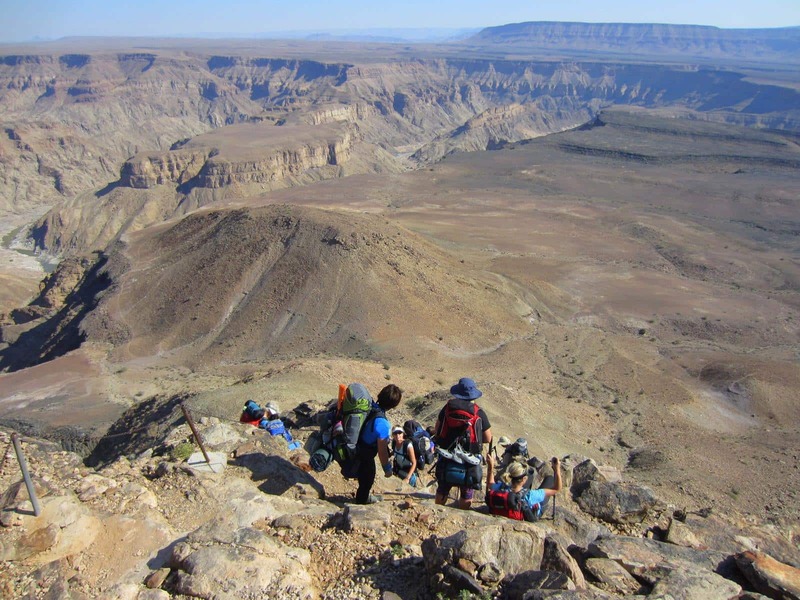 Fortunately it is difficult to get lost between the majestic canyon walls, although hikers must be careful towards the end of the hike as the canyon widens. There are sufficient long stretches of beach that provide ideal camping spots and we managed to pick up enough wood for a bonfire each night. The oldest rocks in this region existed long before today’s continents were formed by the break-up of the Gondwana super continent. These basement rocks are 2 000 million years old, almost half the age of earth. Since then tectonic movement, erosion, climatic forces and volcanism have shaped the complex geology that we see today. The formation of the canyon itself started about 350 million years ago. A geologist’s paradise, its walls display a clear record of much of the geological history of the region. It is unfathomable that today’s canyon once used to be the huge Namaqualand Mountains which were eroded to a vast plain, then became the Nama Sea when continental drift caused an ocean trough. It took millions of years to completely fill the Nama Sea with sediment which was transformed into hard metamorphic rock by heat and pressure. It was only much later that erosion started playing its part in creating the canyon. Today the plant and animal life in the canyon is quite surprising: Hartmann’s mountain zebra, leopard, baboon, rock hyrax, kudu, klipspringer, wild horses, rock lizard, leguaan, dragon flies and scorpions. Among the birds that we saw were fish eagle, grey heron, and Meyer’s parrot. The route is not technical at all and is mostly quite flat. The initial descent, however, is slow and challenging for people with acrophobia, luckily aided by chains. 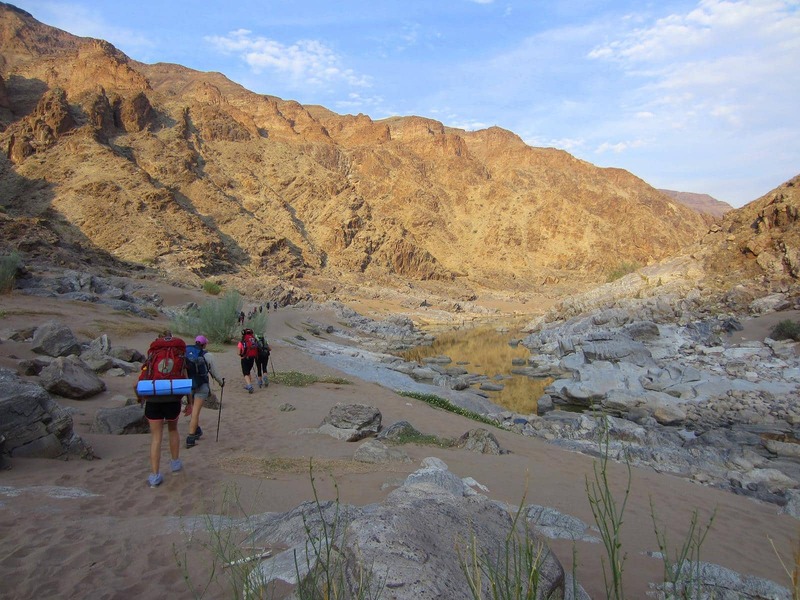 According to a guide that we had met, the river was the lowest that he had seen it in his 21 traverses, explaining why we had no wet river crossings and a lot of deep sand. However, the water level was still high enough to afford us a lunch time swim every day, a wash at the end of each day and sufficient drinking water. Our group at the starting point. From the starting point, we descended the 500 odd metres to the floor of the canyon. We had a big group (20 people) of whom one had a serious fear of heights, so the descent took us 2,5 hours. Beautiful light on the canyon walls. Once down, we were all very grateful to give our ‘jelly’ legs a break and camp on a long stretch of beach where we could wash off the first sweat of the hike. Although the going was tough, the stunning rock formations and soft light on the rock faces intrigued us. 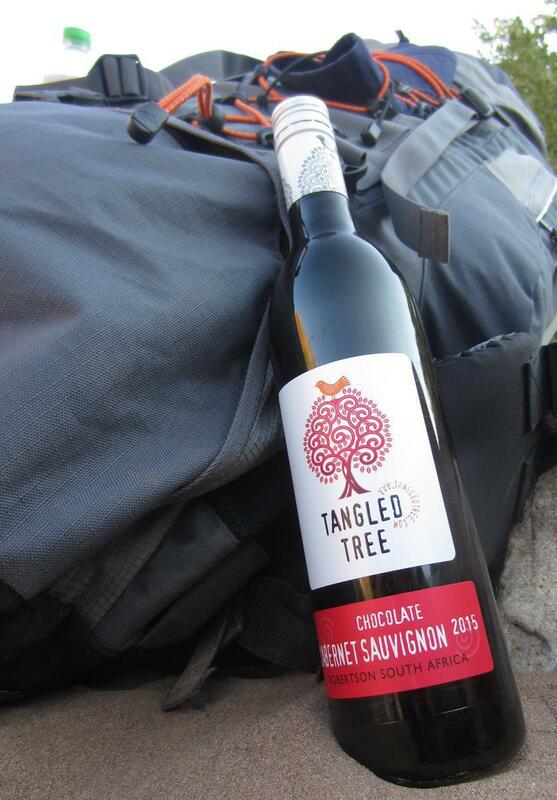 The light-weight and unbreakable packaging of Tangled Tree wines makes it the ideal wine to take on a hike. Day 1: Total walked = 11,5km. Trek time (including tea and lunch stops) = 8:03. 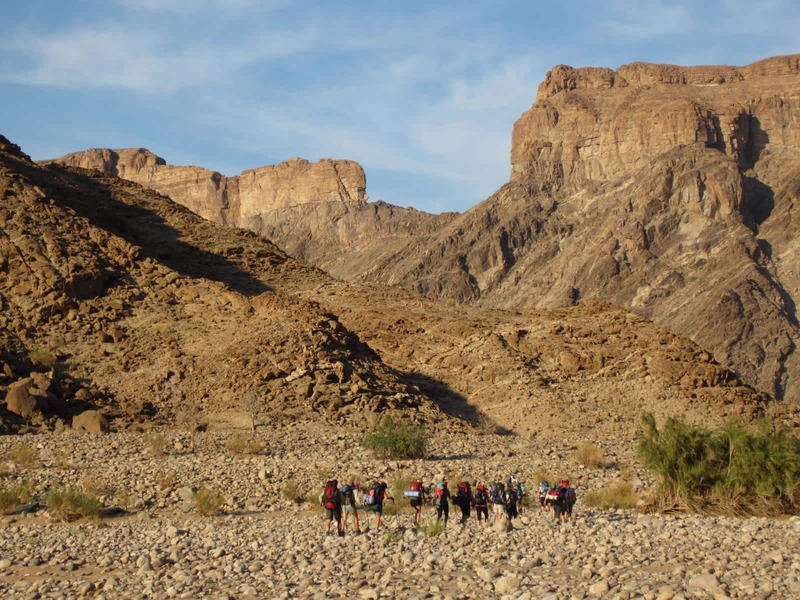 Next morning from our camp we walked in the shadow of the canyon for most of the day on long stretches of deep sand interspersed with rocky river crossings. It was warm but fortunately a sporadic gentle breeze cooled us. 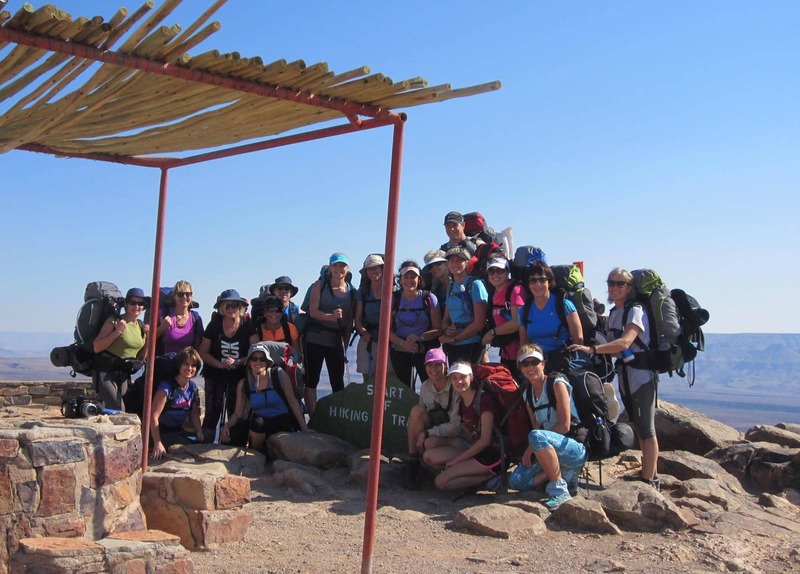 Although the majority of our group were experienced hikers, about half hiked with well ventilated running shoes instead of hiking boots. This was a huge mistake as the sand filtered through the mesh and they ended up having to stop every few kilometres to clear their shoes. Although the terrain is difficult, it is extremely scenic and we thoroughly enjoyed a swim during our lunch break as it was hot. Johann and Michelle Groenewald with the sole remains of one of three Vespa scooters after an attempt to drive them down the canyon in 1968. Day 2: Total walked = 17.4km. Trek time (including tea and lunch stops) = 8:16. All bodies awoke sore and stiff from the heavy backpacks. The day started out on boulders (all shapes and sizes) and once again long stretches of thick sand. 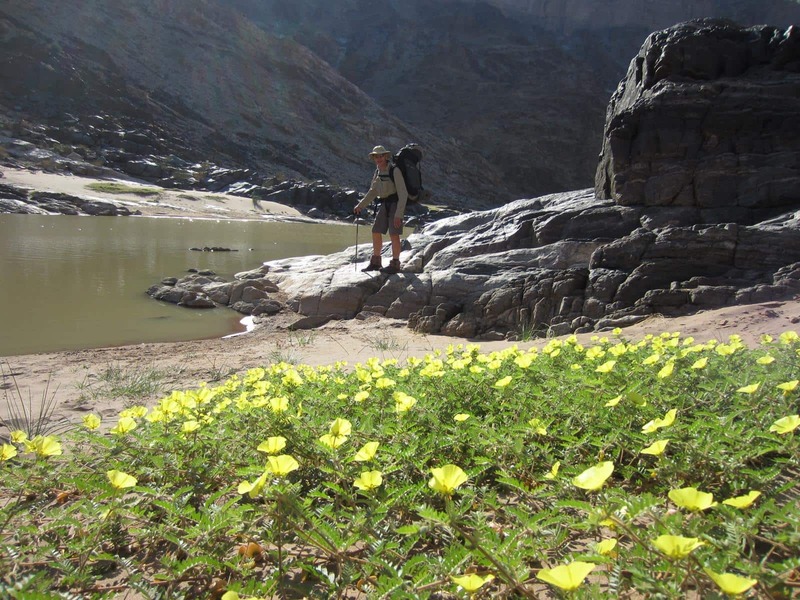 Although the going was slow and tough, the load of the backpacks was alleviated by the splendour of the towering canyon walls and the plant and animal life down in the canyon. Walking in the shade of the canyon walls (Photo: Jeanne Heunis). After 16 rugged kilometres we reached Palm Springs with its hot sulphur spring water flowing at 57°C. This is the ideal place to have a tea or lunch stop and rejuvenate sore feet and aching bodies in the pools below the spring, if you don’t mind a slight eggy whiff in the air. Relaxing sore feet in the pools of Palm Springs. About half an hour’s walk from the springs there is a beach where we had our lunch stop and enjoyed a swim. After that it became very hot and dry as we turned away from the river. Everybody was tired, the bodies sore and many had blisters by the time we reached our overnight spot. All were very relieved to take off their backpacks! Day 3: Total walked = 17.9km. Trek time (including tea and lunch stops) = 7:59. 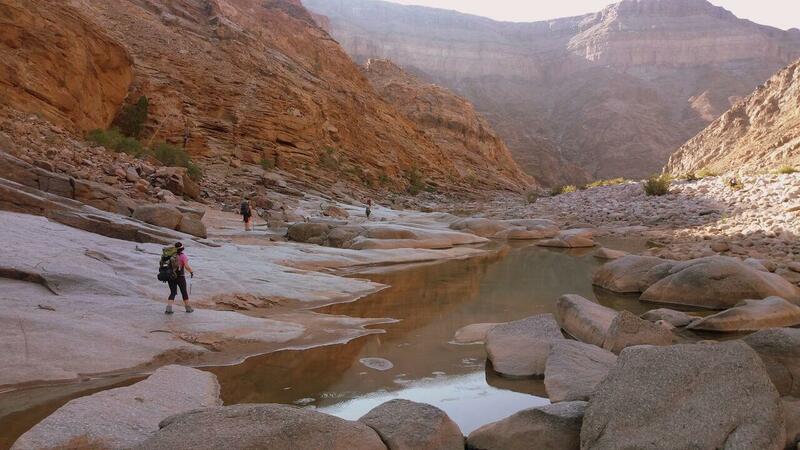 The going got a bit easier as the canyon widened, although there still were patches of thick sand. The terrain was dry and rocky and the sun blazed once out of the shade of the canyon walls. Not long after the 40km mark we took a shortcut to cut out a long loop in the river, over a steep hill that tested a few nerves. Walking away from the river. Trekking through a moon landscape. Day 4: Total walked = 18,8km. Trek time (including tea and lunch stops) = 8:34. We started out next to the river, mostly on big boulders which aren’t really difficult to walk on unless you have knee or ankle problems. We once again encountered long patches of deep sand and this is where wider soled boots helped those who had them. Starting the day next to the river. Most of the day was again hot and dry as we walked away from the river, taking two shortcuts, none as strenuous as that of the previous day. These provided a nice break from the riverine scenery and gave us a glimpse of more rugged country. Always grateful to reach camp we spent a cool night with a few gusts of wind briefly kicking up some sand. A dry trek away from the river. Breathtaking sunset on our last evening. Just as everybody was getting used to their backpacks, so they became lighter! The canyon opens up and the terrain is mostly flat, with plenty of thick sand. We started early and the lure of luxuries ensured a brisk pace on this last day, finishing at Ai-Ais at around 10:00. Feeling a great sense of achievement we rejoiced with ice-cold drinks while some went off to relax in the warm waters of the spring. Desperate measures to try and keep deep sand out of shoes! 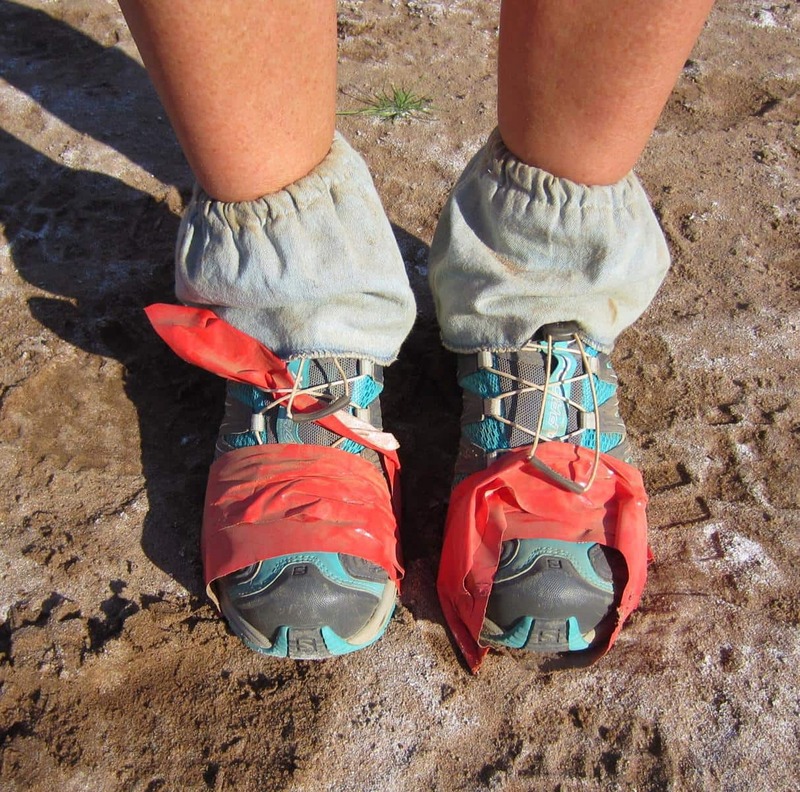 The ankle skirts made by Hanli Swart really helped to keep sand out of boots but the masking tape on the trainers did not last long. You will need a good backpack of at least 45 liter capacity to fit everything in. Pack enough food to eat well but be careful not to overload your pack. The golden rule is that you should not carry more than a quarter of your body weight. Make sure that you pack is adjusted to fit, so that the bulk of the weight is supported on your hips, without the hip belt cramping the upper thigh muscles. Take good hiking boots. DON’T walk in sneakers as you will have to cross long stretches of deep sand which will creep through the mesh of your shoes, chafe your skin and make your walk really uncomfortable. Also, boots will give you better ankle support over the boulders. A walking stick is a huge help on the boulders and especially during the steep descent on the first day. Sun hat, sunglasses and plenty of sunblock. One set of clean underwear for each day and two pairs of socks. Wearing knee-high stockings or thin socks underneath your thick socks (preferably mohair hiking socks without seams) really helps to limit blisters. Two clean shirts that dry quickly and two pairs of shorts to walk in. One pair of slacks and a warm top for the evenings as well as a thin wind jacket. A buff, beanie, thermal tights and socks to sleep in. An extra pair of comfortable shoes to wear in the evening. 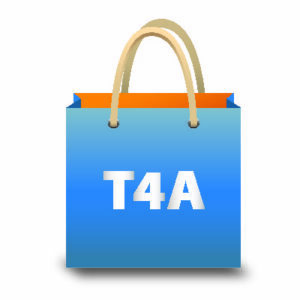 Toiletries (remember your lip balm and biodegradable soap). Small towel (a drylite towel is light, takes up little space and dries quickly). Remember to take a head lamp. Toilet paper and matches (please burn your toilet paper for the sake of the environment – it will not degrade and is exposed by wind). Thick space blanket and/or ground sheet. Mattress, sleeping bag and liner. Hiking gas stove, firelighter and set of pots. Coffee mug, plate, fork, knife, spoon and pocket knife. Dishwashing liquid, sponge and drying cloth. A collapsible basin will be helpful. A plastic container or bucket of at least 2 litres with which you can fetch water for cooking and washing. Hang this on the outside of your backpack. Water purifying drops, tablets or filter bottle. A small first aid kit with bandages (or ankle guard in case of ankle sprains), mercurochrome and plasters (in case of blisters), electrolytes for dehydration and Imodium for diarrhea. Paper map of the hike and a GPS with T4A map. 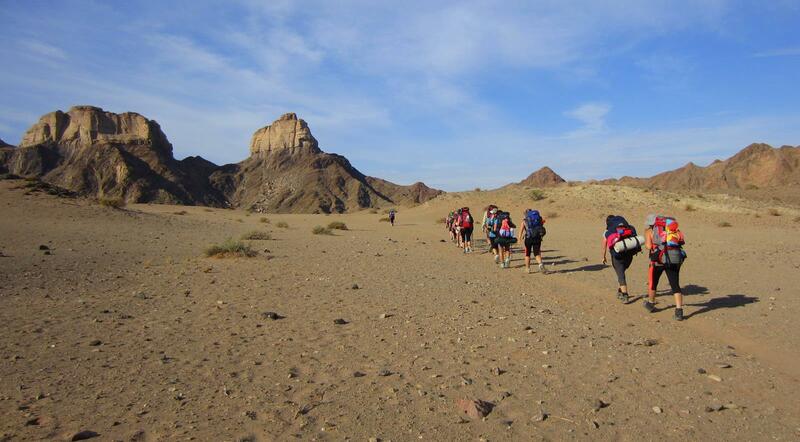 You will have to supply your medical aid name and number when you sign in for the hike at Hobas camp. 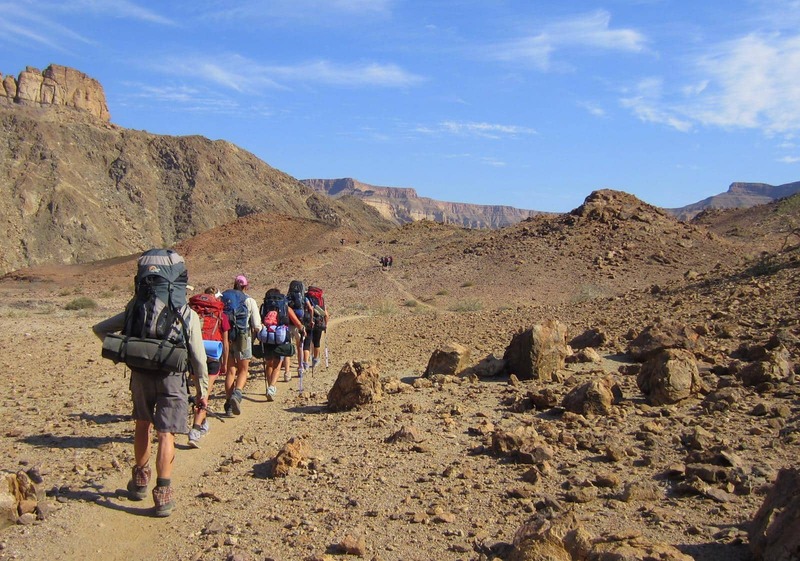 As a safety measure the group should have a designated hiker who will cover the rear and make sure that nobody is left behind. 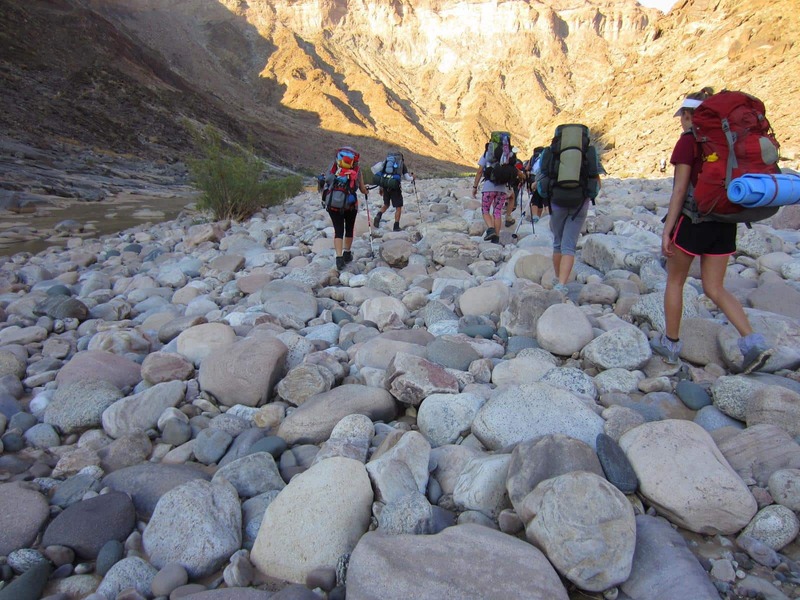 There aren’t any official overnight stops, so your group must cover enough distance each day to ensure that you finish the hike in time. The first third of the hike takes the longest but is also the most scenic. Don’t worry if you only manage around 15km per day on the first two days; the terrain evens out towards the end and gives you opportunity to make up on distance. If you vacuum pack your meat, you can braai every night. However, this luxury will cost you dearly in terms of the weight that you have to carry. A compression bag will reduce the space that your sleeping bag takes up in your backpack tremendously. A liner for your sleeping bag will keep it clean and if it is hot you can sleep in just the liner to protect you from insects. You can buy one at an outdoor store or make yourself one by folding a sheet and stitching it together. Taking a tent is very much a matter of preference. Some members of our group took tents and were very happy for it, mostly because they could keep all their things out of the sand and have a bit of privacy. But those of us who did not take tents didn’t regret it. We loved sleeping out in the open under the stars. We found that thin foam mattresses didn’t really provide enough of a cushion, unless you fold them double. The inflatable mattresses are a bit heavier (unless you can get a three-quarter length) but do offer more comfort. We only needed our warm gear on the last night, but you should go well prepared for cold weather as that could really make your hike unbearable if you can’t keep warm in the evenings. Take a geologist with you, or at least read up about the geology of this magnificent area before you go. Start out as early as possible every day. 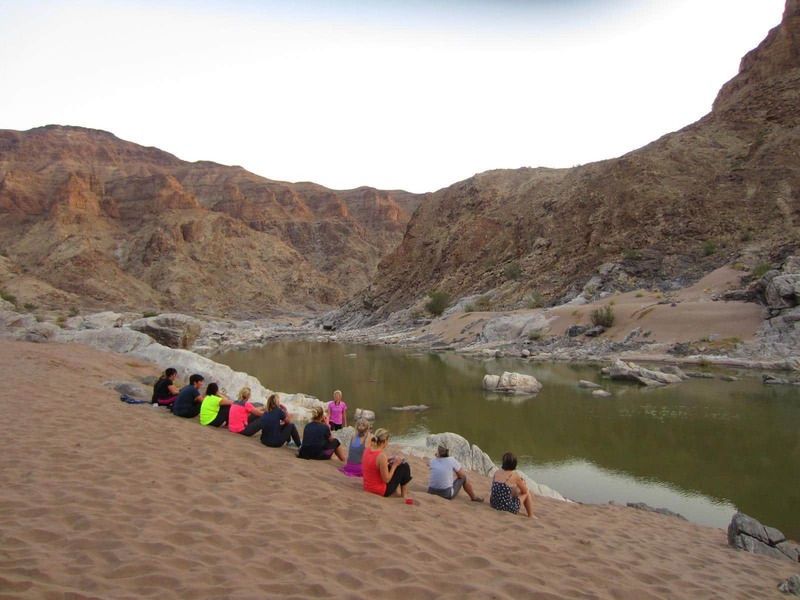 Apart from being the most beautiful time of day, it also affords you coolness for a part of the day as you are able to walk in the shadow of the canyon. A variety of light-weight hiking food is available. See this review. A maximum of 30 hikers per day are allowed and because of extreme weather conditions the hike is only open between 1 May and 15 September. It may be closed during years of severe drought. There are two escape routes. A shuttle service is available between Ai-Ais (the end) and the starting point near Hobas. Booking is essential. Camping and chalets are available at Ai-Ais and camping at Hobas. Minimum age allowed to do the hike is 12, but with the weight that hikers have to carry, I would advise against taking children of that age. 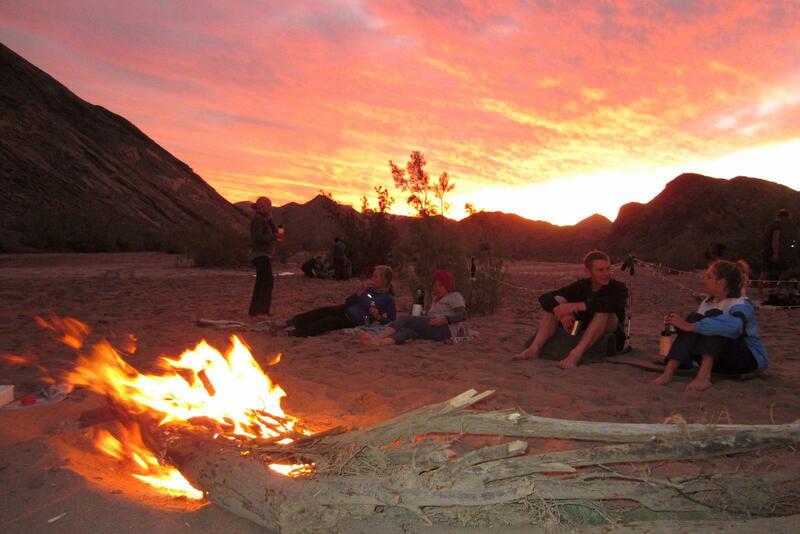 Bookings can be made by contacting Namibia Wildlife Resorts (NWR) at reservations@nwr.com.na or tel. +264 61 285 7200. You can also contact the Ai-Ais Resort at +264 63 683 676/7 or Hobas Camp at +264 63 266 028.